Having been in the food industry for 26 years, Hiran Fernando knows all the nuances of the trade. 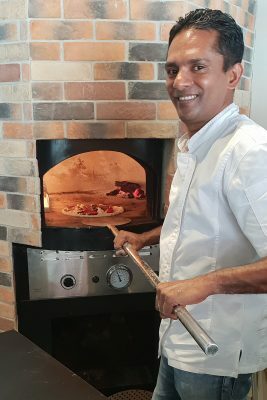 A specialist in French and Italian cuisines, he has sharpened his skills over the years by working in several top restaurants and hotels in Colombo, Dubai and Singapore. The 46-year-old has now gathered all the experience he has garnered over nearly three decades of cooking and put it into an effort that is close to his heart. The speciality chef has started Zazz Pizza along with his partner Sanjaya De Silva. The urban dictionary defines zazz as “a quantifiable amount of something special”. The higher the amount the more likely it will be successful and awesome. Hiran has indeed put in a big amount of work into the preparations that is on offer at Zazz Pizza. Needless to say, the range is awesome. The Italian restaurant at 1A Short Street has a casual, laid-back look, with plastic chairs and tables indoor and outdoor. But the quality of food it serves is top class. I was fascinated by the softness of the dough that went into the making of its speciality, Zazz Pizza ($24). The ingredients included Australian ribeye, mixed mushrooms, parmesan, truffle cream, rucola, cherry tomatoes and mozzarella. The dough is hand-stretched, not rolled. It is then topped with the customer’s choice of toppings and immediately quick-baked in a wood-fired oven. I must say the pizza was fresh and hot and just melted in my mouth. Amazing. Zazz Pizza also serves classic wood-fired pizzas such as Margherita ($16), Hawaiian ($20), Grilled Pesto Chicken ($20) and Frutti di Mare ($24). Its speciality white food-fired pizzas include Zazz Origin ($20) and Contadina ($24). You can also Build Your Own pizzas with toppings for $16 each. Actually, the restaurant’s name Zazz Pizza is misleading, as its menu includes salads, starters, pastas, paninis and burgers. Among the salads, I opt for the vegetarian Zazz Salad ($11). It is wholesome: grilled ricotta cheese, carmelised onion bruschetta with mesclun, roasted pumpkin, pomegranate, cherry tomatoes, hazelnuts, red and white quinoa, dried figs and croutons. The choice of dressing: Balsamic vinaigrette, Thousand island, Zazz special vinaigrette, Zazz pesto and Caesar. The toppings at $2.50 each: Grilled pesto chicken, grilled prawns, crispy prosciutto, boiled egg ($1.50), Parma ham, fresh mozzarella, avocado and grilled ribeye. Among the starters, I liked the vegetarian Bruschetta Mixed Platter. You can have any three pieces for $11 or all four for $12.50. The four are tomato and basil, carmelised onion and grilled ricotta cheese, eggplant and burrata and mixed mushroom and cream cheese. Tomato and basil are common in Singapore. What you have at Zazz Pizza is four toppings, a wider choice. I also tried out the Prawns in Spicy Italian Aromatizzati Sauce ($12.50). It is another Hiran speciality, pan-fried prawns in olive oil, garlic, chilli and white wine. It is yummy with seafood sauce. My last dish is the Chili Crab Burger ($16), something that Hiran came up with “because a lot of people in Singapore like crabs”. The bun is homemade and the patty is the chef’s creation. Of course, I loved it as the bun is soft and the meat delicious. Zazz Pizza has an extensive pasta menu. Seafood lovers will like the Squid Ink Tagliolini and Seafood Spaghetti. If you are looking for a bit more spice, the Angel Hair Pasts Prawns in Zazz Spicy Sauce is not to be missed. The Spaghetti Meatball, Carbonara, Linguine Pesto Chicken and Lasagne are “comfort food” that will certainly evoke memories of your childhood. The desserts focus on chocolate. You can choose from Chocolate Brownie with Ice Cream, Tiramisu and Mousse. The desserts do not contain alcohol, so they are child-friendly. Another good thing about Zazz Pizza is that more than 20 per cent of its menu feature vegetarian dishes. The beers (Peroni, Tiger and Heineken) are priced at just $6 a bottle (300ml). Choice sparkling, red and white Italian wines come at $37 or $42 a bottle.